Eighteen Visions (sometimes shortened to 18V) was founded in 1996 by James Hart and Ken Floyd (who then played drums), the only members of the original line-up to perform with the band until they disbanded. Their debut release was the "Lifeless" EP on Life Sentence Records. They followed this with a full-length album titled "Yesterday Is Time Killed" on Cedargate Records. Upon switching to Trustkill Records, they recorded their 2000 album Until The Ink Runs Out. For their next album, "Best Of", the band re-recorded much of their earlier, out of print, material. Their debut release was the "Lifeless" EP on Life Sentence Records. They followed this with a full-length album titled "Yesterday Is Time Killed" on Cedargate Records. Upon switching to Trustkill Records, they recorded their 2000 album Until The Ink Runs Out. For their next album, "Best Of", the band re-recorded much of their earlier, out of print, material. The music style of the band changed a lot since their 2002 debut "Vanity", which birthed a music video single for "You Broke Like Glass" which played in heavy rotation via MTV2's Headbangers Ball. Eighteen Visions then released "Obsession" in 2004 which would be their last album for Trustkill Records. On July 18 2006 they released a self-titled album through Epic Records. Their single "Victim" climbed the Billboard Hot Mainstream Rock Tracks, and was the official theme song of WWE Vengeance that year. 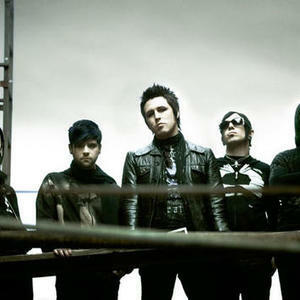 Eighteen Visions broke up in April 2007.